The Modi government is in the departure lounge. It's time to threaten and mislead people is over," Congress leader Anand Sharma said. PM is lowering political discourse will language full of violence, Anand Sharma said. 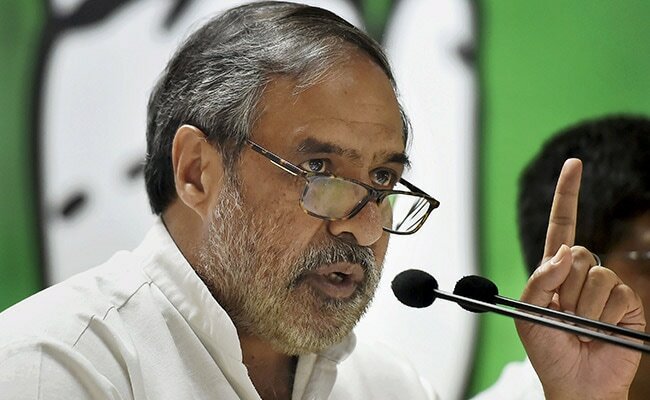 In a scathing attack on Prime Minister Narendra Modi, senior Congress leader Anand Sharma said today that his government was in the "departure lounge" and the time to "threaten and mislead" people was over. Mr Sharma also accused the PM of lowering the political discourse with language "full of bitterness and violence". "The Modi government is in the departure lounge. It's time to threaten and mislead people is over. He considers his political rivals as his personal enemies. We don't want to engage in conversation by stooping to that level," Mr Sharma told reporters in Mumbai, in response to a question on PM Modi's criticism of the Congress manifesto. Mr Sharma said PM Modi was not speaking about what he promised in 2014 and if he fulfilled it. "Instead, he is talking about sending his opponents to jail. It doesn't take five years to send people to jail," he taunted. "The Congress doesn't need a certificate of nationalism and patriotism from the BJP, whose ideology supported the British and not Mahatma Gandhi, (former prime minister) Jawaharlal Nehru and (India's first Home minister) Sardar Vallabhbhai Patel during the Independence movement," Mr Sharma added. Referring to criticism of the Congress's promise to scrap the sedition law and review the Armed Forces (Special Powers Act (AFSPA), Mr Sharma said his party has "zero tolerance against terrorism" and that it was committed to strengthening the national and internal security. He claimed there were demands to scrap the sedition law which, he said, was of the pre-Independence era. "During the (previous) UPA rule, a record number of tourists travelled to Kashmir. What happened in the last five years (of NDA government) is for everyone to see," he said.